Where Can I Donate Used Books in New York City? 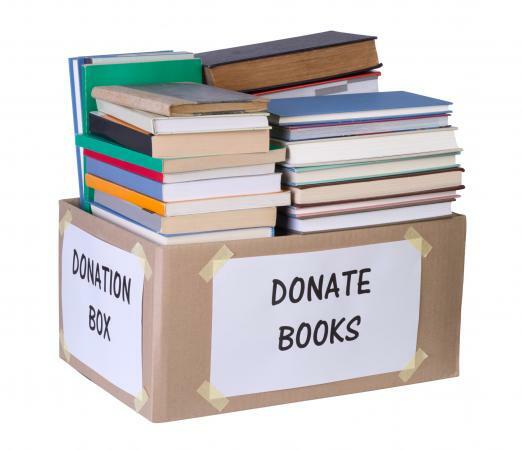 Are you asking where can I donate used books in New York City? If so, consider donating to charity, giving to local children through schools or turning to libraries. Books for children and adults are valuable learning tools that should not be wasted. Throughout New York City and the surrounding region, there are numerous locations to donate books. One of the best ways to get rid of books is to donate them to charities and other nonprofit organizations. To help provide support and encouragement to those in jail, consider donating to Books Through Bars. This organization accepts most types of books and gives them to prisoners who are seeking books within the state. The organization is specifically looking for history books focusing on African American, Latin and Native American cultures, social science books, learning world languages and other how-to books. Paperback books are the most acceptable form since most prisons do not accept hardcover books. For more information on how and when to donate, visit the Books Through Bars website. Reading Reflections is an organization that provides reading material for children. The organization, started by two young brothers, provides books to children who are in desperate need. In some cases, the books remain local while in others the books travel throughout the world. Reading Reflections accepts children's books appropriate for all ages of children. The organization also accepts math and science textbooks, puzzles and other child-appropriate games. The organization does accept donations of adult books since it provides services to adults through the program as well. To donate, visit the Reading Reflections website and fill out the donation form. Corporate, publishers, booksellers and individuals can donate through this method. If you are looking for a place to donate gently used children's books, then the Reach Out & Read program is a great option for you to consider. A major element of the Reach Out & Read program involves having participating pediatrician's offices educate parents about the importance of reading to children during well-child checkup visits. New books are given to children ages six months to five years during these visits. Donated books are either given to siblings who come along to these visits or are placed in waiting areas in the offices of participating physicians. Donated books can be taken to any Read Out & Read program site. If you have a large quantity, it may be better to deliver your gift to the organization's main office in midtown. You should contact the program coordinator in order to make arrangements. The inventory of Housing Works Bookstore Cafe consists entirely of donated books and other media (CDs, DVDs and vinyl). The store will welcome your donation of gently used books in good condition. Not only do they take fiction and nonfiction reading material, they will also take textbooks that are less than a year old. All of the bookstore's profits go to support the work of Housing Works, which helps those who have HIV/AIDS and are in need of assistance with health care, housing, legal assistance, job training and more. To donate to the Bookstore Cafe take the books you want to donate to the store (which is located at 126 Crosby Street). Donations are typically accepted from 10 a.m. until 8 p.m. during the week and 10 a.m. until 4 p.m. on Saturday and Sunday. Note that the store sometimes closes for special events, so it's advisable to call ahead of time to verify that they'll be open before heading over there with a stack of books to donate. New York City libraries will consider accepting most types of books and textbooks from donors, assuming the items are in good condition and the library staff thinks the donated books are appropriate for the library's circulating collection. However, the library does warn it has limited space and cannot accept all donations. Before donating to the library, reach out to your local branch to find out if the books you want to donate meet their requirements. Be prepared to share the titles and condition of the books you wish to donate. If the library wants the books you have, donate them. If the library is unable to house the books, consider making a donation to another organization that may be in need of the titles you have. To find a list of public library branches, visit the New York Public Library website. In addition to accepting donations for library collections, the New York City Public Library also accepts gently used paperback books for its Correctional Services outreach program. This program provides a variety of library-related services, including providing a mobile book program for five jails in the city. As many as 1,200 people per week check out books through this program. Not all subject matter is accepted and you'll need to contact the program director by email before making a donation, so be sure to review their list of acceptable topics and other requirements. Please note that they only want books that are in excellent condition, so that they will appeal to program participants. Hardback books are not accepted. Donations can be made via postal mail or delivered to the Midtown location. Book donations are one of the best ways to give. Books open the door for new opportunities and learning experiences to those who would otherwise not have those experiences.